Children love to snack. Unfortunately, most snacks that you can buy in the store are unhealthy. They’re packed with sugar, fat, and sodium. None of this is good for your health or your children’s. With a little advanced planning, you can have quick and easy snack ideas on hand at home. Here are seven fast snack ideas your kids will love. It sounds so simple and so basic but children love apples and cheese. Add a few whole grain crackers and even some slices of ham and you have a well-rounded and healthy snack idea. The good news is, it only takes minutes to prepare. Make it fun and use a small cookie cutter to cut the cheese into fun shapes. This is an old favorite and can be prepared two ways. The foundation of both preparations is celery sticks cut into two to three-inch lengths. Place natural peanut butter or low-fat cream cheese down the middle. 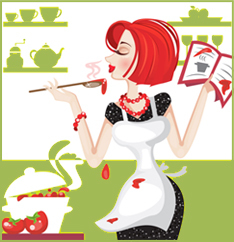 Now top with raisins or chocolate chips – they’re the ants! Gorp stands for good old raisins and peanuts. However, you can give it any twist you like. Many children are allergic or don’t like peanuts. 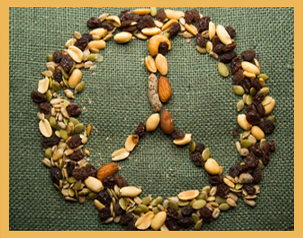 Substitute dried fruit chips, whole grain cereal like Cheerios or Chex. Add a few chocolate chips or candies and your children have a high fiber snack they can eat by the handful. Prepare a large batch of it and serve it as an after-school snack. It’s also great for road trips. Again there are two approaches to this tasty snack. You can use wonton wrappers or corn tortillas. With the wonton wrappers cut them into triangles. You’ll get two triangles per wrapper. Brush them with a little bit of sesame oil and sprinkle with salt. Place them in the oven at 350 degrees F for ten minutes. Watch them carefully. When they begin to brown at the edges they’re done. Let them rest for a few minutes to get crispy, then serve plain or with a fruit-based salsa or chutney. Edamame are soy beans in their shell. You can buy them frozen or fresh. Place them in a microwave-safe bowl. Place water in the bottom of the bowl to steam the beans. Cover with plastic wrap and microwave for three to five minutes. Test. If the beans are still cool, warm for another few minutes. Sprinkle salt on the beans and enjoy. Hummus is a mixture of chickpeas and tahini (sesame paste). It’s usually made to taste. Begin with a can of chickpeas and a tablespoon of tahini. Add garlic, salt and pepper to taste. Serve with vegetables to dip. You can buy an air popper for under twenty dollars. Keep fresh popcorn on hand. You can buy it in bulk. Melt margarine or spray with low-fat margarine topping. Sprinkle salt lightly and enjoy. Kids love to snack and eat. With these seven quick and easy ideas you can be sure they’re eating healthy too. Children are Paying the Price of Bad Nutrition – Don’t Let Yours Be One of Them! Today’s children are receiving a one-two punch of bad nutrition. Not only do families have less time to cook, but healthy activities like tag and sports are giving way to indoor pastimes like watching television, playing game consoles, and using computers. The current generation of children is showing a clear decline in their general standards of health. Please don’t wait. This one purchase could change your child’s life and decrease the likelihood of serious health problems both today and down the road. 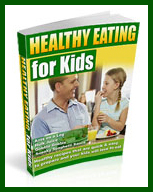 Buy “Healthy Eating for Kids” today, and set your child on the path to lifelong good health.